L., Sp. Pl. 1003. 1753; Müll.Arg. in DC., Prodr. 15, 2: 799. 1866; Benth. in Benth. & Hook.f., Gen. Pl. 3: 311. 1880; Hook.f., Fl. Brit. Ind. 5: 414. 1887; Pax & K.Hoffm. in Engl., Pflanzenr. IV.147.xvi: 12. 1924; Ridl., Fl. Mal. Pen. 3: 273. 1924; Gagnep. in Lecomte, Fl. Indo-Chine 5: 333. 1925; Kanjilal, Fl. Assam 4: 209. 1940; Backer & Bakh.f., Fl. Java 1: 488. 1963; G.L.Webster, J. Arnold Arbor. 48: 370. 1967; Whitmore, Tree Fl. Malaya 2: 51. 1973; Airy Shaw, Kew Bull. 35: 583. 1980; Kew Bull. Add. Ser. 8: 13. 1980; Kew Bull. 36: 246. 1981; Seberg, Nordic J. Bot. 4: 159. 1984; G.L.Webster, Ann. Missouri Bot. Gard. 81: 90. 1994; Philcox, Rev. Handb. Fl. Ceylon 11: 130. 1997; Radcl.-Sm., Gen. Euphorbiacearum: 234. 2004; Ngerns. & Chayam. in Chayam. & Welzen, Fl. Thailand 8, 1: 23. 2005; Sagun, G.A.Levin & Welzen, Blumea 55: 25. 2010; G.L.Webster in Kubitzki, Fam. Gen. Vasc. Pl. 11: 124. 2014.— Caturus L., Syst. Nat. ed. 12, 2: 650. 1767; Mant. Pl. : 19, 127. 1767. Shrubs or annual herbs, monoecious or rarely dioecious; stem lenticellate. Indumentum simple hairs, all parts pubescent. Stipules narrowly-triangular or linear, caducous. Leaves simple, alternate; petioles usually long; blade ovate to rhomboid, chartaceous to coriaceous, base obtuse, cuneate, retuse or caudate, margin variously crenate to serrate, apex acute to caudate, sometimes obtuse, hairy on both surfaces, punctate; ventation basally palmately veined with 3–5 nerves, 2–7 pinnate nerves per side along midrib, veins reticulate. Inflorescences axillary or terminal spikes or panicles, solitary or in groups, when bisexual with staminate flowers apically and pistillate flowers at base, rarely otherwise or unisexual (sometimes abnormal pistillate flowers apically or between staminate and pistillate flowers), sometimes solitary pistillate flowers; bracts often large, margin often lobed or coarsely serrate. Flowers actinomorphic; petals and disc absent. Staminate flowers in groups of 4–15 flowers per node; bracts ovate; sepals 4, valvate; stamens usually 8, free, pistillode absent. Pistillate flowers usually sessile; calyx lobes 3–5, imbricate; ovary (2)3-locular; ovules 1 per locule; style present or not, stigmas much branched. Fruits lobes capsules, dehiscing septicidally into 2-valved cocci. Seeds (sub)globular, smooth, often with a conspicuous caruncle. About 450 species in the tropics and subtropics. 10 species in Thailand. Classification: Subfamily Acalyphoideae, tribe Acalypheae, subtribe Acalyphinae. 1. Acalypha brachystachya Hornem., Hort. Hafn. : 909. 1807; in Willd. Enum. Hort. Berol. : 992. 1809; Müll.Arg. in DC., Prodr. 15, 2: 870. 1866; Hook.f., Fl. Brit. Ind. 5: 416. 1887; Forbes & Hemsl., J. Linn. Soc. Bot. 26: 437. 1894; Pax & K.Hoffm. in Engl., Pflanzenr. IV.147.xvi: 101. 1924; Gagnep. in Lecomte, Fl. Indo-Chine 5: 339. 1925; Backer & Bakh.f., Fl. Java 1: 489. 1963; Radcliffe-Smith, Kew Bull. 28: 526–527. fig. 1A. 1974; Airy Shaw, Kew Bull. 36: 247. 1981; Kew Bull. 37: 2. 1982; Philcox, Rev. Handb. Fl. Ceylon 11: 130. 1997; Ngerns. & Chayam. in Chayam. & Welzen, Fl. Thailand 8, 1: 24. 2005; Sagun, G.A.Levin & Welzen, Blumea 55: 35, Fig. 2d, 4b; Map 6. 2010. 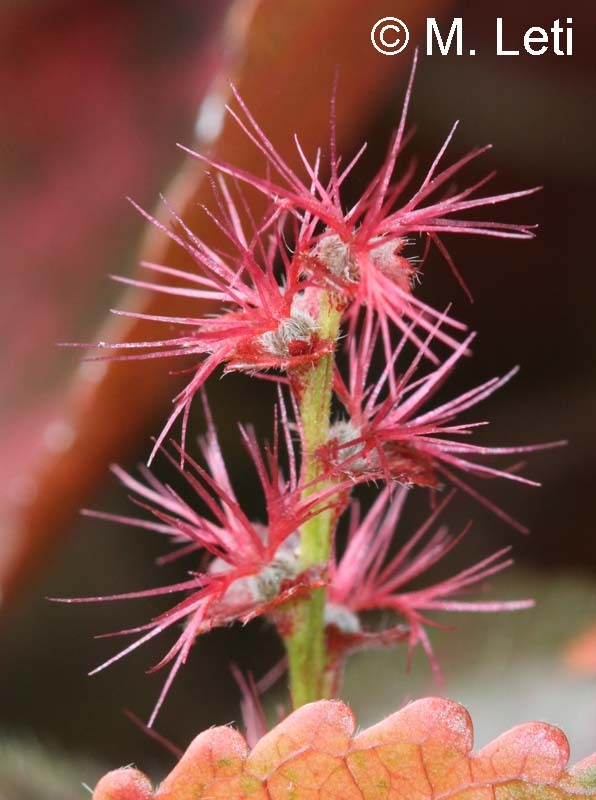 — Acalypha conferta Roxb., Fl. Ind. ed. 1832, 3: 677. 1832. Annual herbs, 10–55 cm, stem erect. Stipules narrowly triangular, 0.8–1 mm long. Leaves: petioles terete, 1–5(–7) cm long; blade ovate or lanceolate-ovate, 2.5(–7.5) by 1–3(–4) cm, chartaceous, base cordate or obtuse, sometimes cuneate, margin serrate or crenulate, apex acute, obtuse or acuminate, scabrous on both surfaces; nerves 2–4 pairs. Inflorescences in groups of (1–)4, axillary, 0.5–1.5(–2) cm long, staminate part apical. Staminate flowers 5–8 per node, buds subglobular, 0.3–0.5 mm in diam. 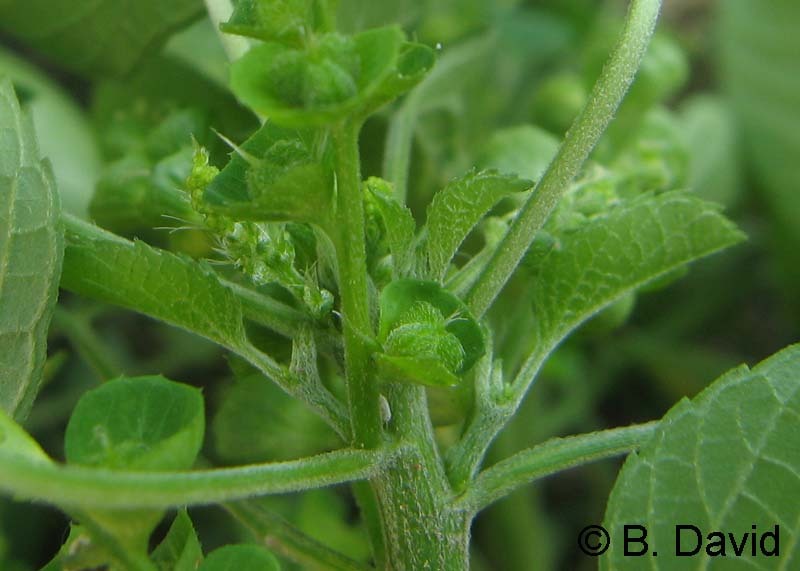 ; bracts ovate-oblong or ovate-lanceolate, 0.6–1 by c. 0.2 mm, pubescent outside; pedicel 0.1–0.2 mm long; sepals ovate, c. 0.5 by 0.3 mm, glandular outside, puberulent. Pistillate flowers 1(–3) per node; bracts broadly ovate, 4–6 by 5–9 mm, with 3–5 deep lobes, margin hispid and with glandular hairs, glabrous inside, hispid outside; sepals 3, ovate, 0.8–1 by 0.3–0.5 mm, hispidulous; ovary globular, 0.8–1 mm in diameter, hispidulous, stigmas 1–2.5 mm long. Fruits 3-lobed, globular or subglobular, 1–1.5 by 1.2–2 mm, hispidulous. Seed ovoid, 1–1.2 by 0.8–1 mm. Sometimes solitary irregular pistillate flowers at the end of branches: pedicels 0.5–1 mm long; sepals 3, ovate-lanceolate, pubescent, style 1, attached at base of ovary, apex fimbriate, ovary 1 locule in fruit; fruits indehiscent, oblate, 2–3 by c. 2 mm, pubescent, with longitudinal suture in the center, apical appendage cup-shaped, 0.8–1.2 mm wide, apically fimbriate. T h a i l a n d.— NORTHERN: Chiang Mai (Doi Suthep, Doi Inthanon), Nan, Lamphun, Lampang; NORTH-EASTERN: Phetchabun; SOUTH-WESTERN: Kanchanaburi, Prachuap Khiri Khan. D i s t r i b u t i o n.— Tropical Africa, Nepal, Phutan, India, Sri Lanka, Indochina (type), Sumatra, Java, Lesser Sunda Islands, Timor and Celebes. E c o l o g y.— Open land, limestone hill, mixed deciduous forest; alt. 200–1,300 m.
V e r n a c u l a r.— Tamyae doi bai bang (ตำแยดอยใบบาง). 2. Acalypha delpyana Gagnep., Bull. Soc. Bot. France 70: 872. 1923; in Lecomte, Fl. Indo-Chine 5: 341. 1925; Airy Shaw, Kew Bull. 26: 205. 1972; Ngerns. & Chayam. in Chayam. & Welzen, Fl. Thailand 8, 1: 25. 2005. Shrubs, ca. 1.5 m high, stem terete, lenticellate. Stipules narrowly triangular, 1.5–2 mm long, pubescent. Leaves: petioles terete, 0.5–2.5 cm long, longitudinally grooved above, pubescent; blade ovate, 2–6 by 1–3 cm, chartaceous, base obtuse or cuneate, margin serrate or crenulate, apex acute or obtuse, pubescent on both surfaces, especially on nerves; nerves 3–5 pairs. Inflorescences solitary, bisexual, axillary, 2–10 cm long, staminate part at base. Staminate flowers 5–10 per node; buds subglobular, 0.3–0.5 mm in diameter; bracts ovate, 0.8–1 by c. 0.5 mm, hispidulous outside; pedicel 0.1–0.2 mm long; sepals ovate, c. 0.5 by 0.3 mm, glandular outside. Pistillate flowers single per node; bracts minute, ovate, 0.8–1 by c. 0.5 mm, margin entire, hispid outside; sepals 3, ovate, 0.8–1 by c. 0.5 mm, hispidulous outside; ovary subglobular, c. 1 mm in diameter, hispidulous, stigmas 3–5 mm long. Fruits 3-lobed, globular or subglobular, 1–1.5 by 1.2–2 mm, hispidulous. Seeds ovoid, 1–1.2 by 0.8–1 mm. 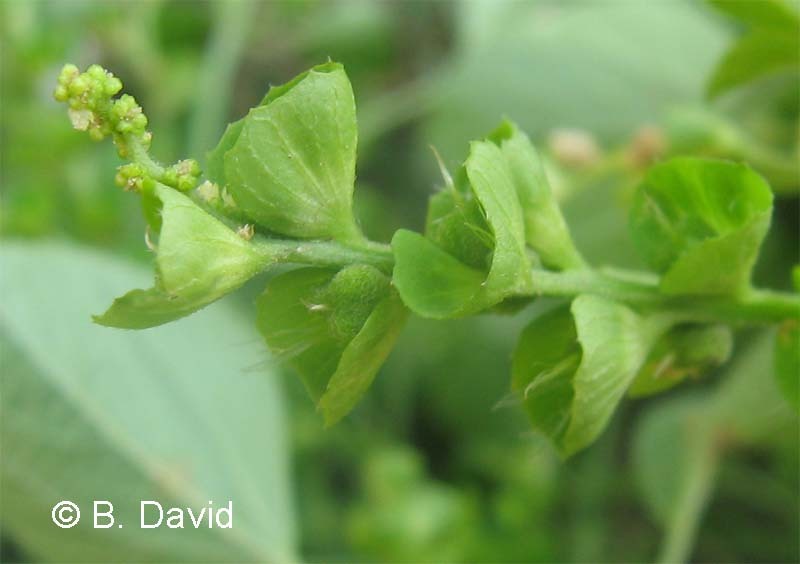 Sometimes solitary irregular pistillate flowers at the end of the branch: pedicel 0.5–1 mm long; sepals 3, ovate-lanceolate, pubescent, style 1, attached at base of ovary, apex fimbriate, ovary 1-locular; fruits of irregular flowers not found. T h a i l a n d.— CENTRAL: Saraburi. D i s t r i b u t i o n.— Laos and Cambodia (type?). E c o l o g y.— In marshy ground, evergreen forest; alt. 30 m.
V e r n a c u l a r.— Khang poi tua mia (ขางปอยตัวเมีย) (Central). 3. Acalypha hispida Burm.f., Fl. Ind. : 303, t. 61, fig. 1. 1768; Müll.Arg. in DC., Prodr. 15, 2: 815. 1866; Hook.f., Fl. Brit. Ind. 5: 417. 1887; Pax & K.Hoffm. in Engl., Pflanzenr. IV.147.xvi: 140. 1924; Backer & Bakh.f., Fl. Java 1: 489. 1963; Airy Shaw, Kew Bull. 26: 206. 1972; Kew Bull. Add. Ser. 8: 18. 1980; L.M.Perry, Med. Pl. East and Southeast Asia: 136. 1980; Airy Shaw, Kew Bull. 37: 3. 1982; Long, Fl. Bhutan 1(3): 797. 1987; Keng, Concise Fl. Sing. : 105. 1990; Ngerns. & Chayam. in Chayam. & Welzen, Fl. Thailand 8, 1: 26. 2005; Sagun, G.A.Levin & Welzen, Blumea 55: 44. 2010. Shrubs, 1–3 m high, possibly dioecious; branches terete, lenticellate, pubescent when young. Stipules triangular, 5–8 mm long, margin serrate or entire, pubescent. Leaves: petioles 2–11 cm long, longitudinally grooved above, pubescent; blade ovate or broadly ovate, 7(–11) by 1–3.5(–5) cm, coriaceous, base retuse or obtuse, margin crenulate-serrate, apex acute or acuminate, hispid on both surfaces; nerves 5–7 pairs. Inflorescences solitary, with only pistillate flowers, axillary, pendulous, (10–)15–35 cm long, flowers densely set, rachis not visible. Staminate flowers unknown. Pistillate flowers 3–8 per node; bracts minute, ovate, 0.5–1 by 0.3–0.5 mm, margin entire, pubescent outside; sepals 3, ovate, 0.7–1 by 0.3–0.5 mm, pubescent outside; ovary subglobular, 1–1.5 mm in diameter, tomentose, stigmas dark red, 3–6 mm long. Fruits unknown. T h a i l a n d.— Cultivated. D i s t r i b u t i o n.— India (type), Malay Peninsula, New guinea. E c o l o g y.— Cultivated as ornamental, only pistillate plants known. V e r n a c u l a r.— Kiao klao (เกี้ยวเกล้า), mai phrom (ไหมพรม) (Northern); hang krarok daeng (หางกระรอกแดง) (Bangkok); hang maeo (หางแมว) (Central); hu plachon (หูปลาช่อน) (Ratchaburi); Chenille plant, Red not cat's tail. U s e s.— The roots, leaves and flowers are used as medicinal plants. Also an ornamental plant. 4. Acalypha indica L., Sp. Pl. : 1003. 1753; Müll.Arg. in DC., Prodr. 15, 2: 868. 1866; Drury, Useful Pl. Ind. : 10. 1873; Hook.f., Fl. Brit. Ind. 5: 416. 1887; Forbes & Hemsl., J. Linn. Soc. Bot. 26: 438. 1894; Pax & K.Hoffm. in Engl., Pflanzenr. IV.147.xvi: 33. 1924; Ridl., Fl. Mal. Pen. 3: 274. 1924; Gagnep. in Lecomte, Fl. Indo-Chine 5: 336. 1925; Backer & Bakh.f., Fl. Java 1: 490. 1963; Airy Shaw, Kew Bull. 26: 206. 1972; Whitmore, Tree Fl. Mal. 2: 51. 1973; Radcliffe-Smith, Kew Bull. 28: 526–528, fig. 1G. 1974; Satyavati, Med. Pl. Ind. 1: 8. 1976; Airy Shaw, Kew Bull. Add. Ser. 8: 18. 1980; Perry, Med. Pl. East. and Southeast Asia: 136. 1980; Airy Shaw, Kew Bull. 36: 247. 1981; Sen, Ecol. Approaches Ind. Weeds: 75. fig. 2, 30. 1981; Airy Shaw, Kew Bull. 37: 3. 1982; Keng, Concise Fl. Sing. : 105. 1990; Philcox, Rev. Handb. Fl. Ceylon 11: 132. 1997; Ngerns. & Chayam. in Chayam. & Welzen, Fl. Thailand 8, 1: 26, plate I: 1. 2005; Sagun, G.A.Levin & Welzen, Blumea 55: 45, Fig. 2h, 4c; Map 12. 2010. 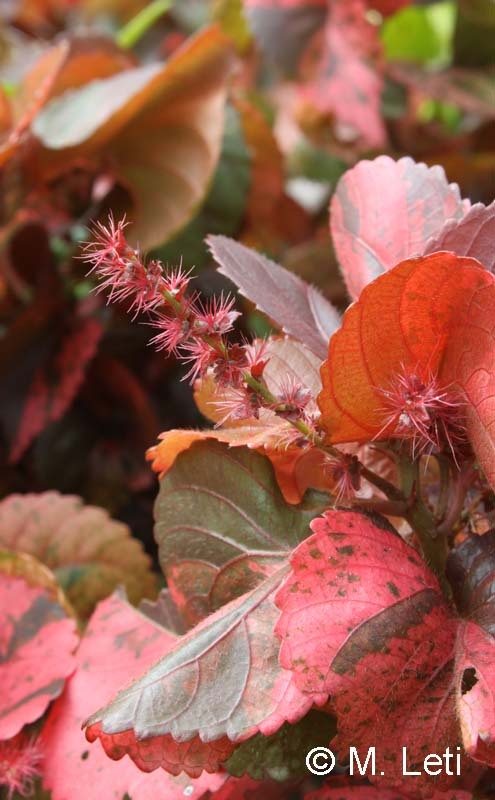 — Acalypha chinensis Benth., Fl. Hongk. : 303. 1861. Annual herbs, 15–90 cm high; stem erect, terete, longitudinally grooved, pubescent. Stipules narrowly triangular, 1–2 mm long, margin with glandular hairs. Leaves: petioles terete, 2.5–7(–8) cm long, longitudinally grooved above, pubescent; blades rhomboid, 3–7 by 2–6(–7.5) cm, chartaceous, base cuneate, margin crenulate-serrate, apex acute or obtuse, glabrous on both surfaces except for the pubescent veins; nerves 4 or 5 pairs. Inflorescences 1(or 2) together, bisexual, axillary (to terminally), (2–)4–9(–11) cm long, staminate part apical, 0.5–1.5 cm long, pistillate flowers at base. Staminate flowers 6–10 per node; bracts ovate-oblong or ovate-lanceolate, 0.8–1 by 0.2–0.3 mm, pubescent outside; buds subglobose, 0.3–0.7 mm in diameter; pedicel 0.1–0.2 mm long; sepals 4, ovate, c. 0.5 by 0.3 mm, glandular outside, puberulent. Pistillate flowers 1(–4) per node; bracts cup-shaped, 4–9 by 5–13 mm, remotely serrate with 8–12 teeth, glabrous inside, pubescent outside, with visible venation, with translucent dots; sepals 3, ovate, 0.7–1.5 by 0.3–0.5 mm, pubescent and with glandular hairs; ovary subglobular, c. 1.5 mm in diameter, pubescent, stigmas 2–3.5 mm long. Fruits 3-lobed, oblate or subglobular, 1.8–2.2 by 2–2.8 mm, pubescent and with glandular hairs. Seeds ovoid, 1.2–1.5 by c. 1 mm. Sometimes solitary irregular pistillate flowers at the end of the branches: pedicel 0.5–5 mm long; sepals 3 or 4, ovate-lanceolate, pubescent, style 1, attached at base of ovary, apex fimbriate, ovary 1-locular; fruit indehiscent, oblate, 2–3 by c. 2 mm, pubescent, with longitudinal suture in the center, appendages tubular at apex, 0.8–1 mm wide, fimbriate apically. T h a i l a n d.— NORTHERN: Mae Hong Son, Chiang Mai, Lampang, Phitsanulok, Kamphaeng Phet, Nakhon Sawan; NORTH-EASTERN: Maha Sarakham, Khon Kaen; EASTERN: Chaiyaphum, Nakhon Ratchasima, Buri Ram, Surin, Si Sa Ket, Ubon Ratchathani; SOUTH-WESTERN: Uthai Thani, Kanchanaburi, Ratchaburi, Phetchaburi, Prachuap Khiri Khan; CENTRAL: Lop Buri, Phra Nakhon Si Ayutthaya, Saraburi, Nakhon Pathom, Pathum Thani, Nakhon Nayok, Nonthaburi, Bangkok; SOUTH-EASTERN: Sa Kaeo, Prachin Buri, Chachoengsao, Chon Buri, Chanthaburi; PENINSULAR: Chumphon, Surat Thani, Krabi, Nakhon Si Thammarat, Phatthalung, Trang, Songkhla, Narathiwat. D i s t r i b u t i o n.— U.S.A. (Guam), Tropical Africa, India, Sri Lanka (Lectotype), China, Japan, Taiwan, Indochina, Malaysia, Singapore, Philippines, Sumatra, Java, Lesser Sunda Islands, Timor and Celebes. E c o l o g y.— Weeds in cultivation, along roadside; alt. 0–300 m.
V e r n a c u l a r.— Tamyae tua phu (ตำแยตัวผู้), tamyae maeo (ตำแยแมว) (Central); han maeo (หานแมว) (Northern); lang ta kai (ลังตาไก่) (Trang). U s e s.— Medicinal plant (citation in Perry!). 5. Acalypha kerrii Craib, Bull. Misc. Inf. Kew 1911: 465. 1911; Pax & K.Hoffm. in Engl., Pflanzenr. IV.147.xvi: 110. 1924; Airy Shaw, Kew Bull. 26: 206. 1972; Ngerns. & Chayam. in Chayam. & Welzen, Fl. Thailand 8, 1: 27, fig. 1. 2005.— Acalypha acmophylla Hemsl., J. Linn. Soc. Bot. 26: 436. 1894; Brandis, Ind. Trees: 555. 1906; Pax & K.Hoffm. in Engl., Pflanzenr. IV.147.xvi: 137. 1924; Gagnep. in Lecomte, Fl. Indo-Chine 5: 335. 1925.— Acalypha lacei Hutch., Bull. Misc. Inf. Kew 1914: 381. 1914; Pax & K.Hoffm. in Engl., Pflanzenr. IV.147.xvi: 131. 1924.— Acalypha siamensis Gagnep., Bull. Soc. Bot. France 70: 874. 1923.— Acalypha heterostachya Gagnep., Bull. Soc. Bot. France 70: 874. 1923.— Acalypha gagnepainii Merr., J. Arnold Arbor. 19: 39. 1938. Shrubs, 1–4 m high, stem irregulary branched, lenticellate, young twigs pubescent. Stipules linear, 3–7 mm, hispid. Leaves: petioles terete, (1–)2–7(–9) cm long, longitudinally grooved above, hispid; blade ovate or ovate-lanceolate, (3–)4–12(–15) by (1–)2–5(–7) cm, chartaceous, base obtuse, cuneate or retuse, with 2 glands, margin serrate or crenulate-serrate, apex acute, acuminate or caudate, hispid on both surfaces, glabrescent above; nerves 4 or 5 pairs. Inflorescences in groups of (1–)8, axillary, bisexual or only staminate or solitary condensed pistillate inflorescences, (1–)2–4(–6) cm long, almost completely staminate except for a short, basal pistillate part. Staminate flowers 5–8 per node; bracts ovate, 1–1.5 by 0.8–2 mm, hispid outside; buds subglobular, 0.5–0.7 mm in diameter; pedicel 0.2–0.3 mm long; sepals ovate, c. 0.5 by 0.3 mm, glandular outside, puberulent. Pistillate flowers single per node; bracts ovate or reniform, oblique, 2–4 by 2–5 mm, serrate with 4–7 teeth, hispid on both surfaces, longitudinally veined, with translucent dots; sepals 3, ovate, 0.7–1 by 0.3–0.5 mm, hispid outside; ovary subglobular, c. 1 mm in diameter, hispid, stigmas 1.5–3 mm long. Fruit not seen. T h a i l a n d.— NORTHERN: Mae Hong Son, Chiang Mai (Doi Suthep, type: KERR 1165, K n.v.), Chiang Rai, Lampang; NORTH-EASTERN: Phetchabun, Loei; SOUTH-WESTERN: Kanchanaburi. D i s t r i b u t i o n.— India, China, Burma and Vietnam. E c o l o g y.— In open areas, along streams, waste ground, mixed deciduous and dry evergreen forest; alt. 200–1500 m.
V e r n a c u l a r.— Khang poi (ขางปอย) (Chiang Mai); khang poi nam (ขางปอยน้ำ) (Northern, Central); plao nam (เปล้าน้ำ) (Lampang). 6. Acalypha lanceolata Willd., Sp. Pl. ed. 4: 524. 1805; Airy Shaw, Kew Bull. 26: 206. 1972; Chin, Limestone Fl. Mal. 1: 220. 1973; Whitmore, Tree Fl. Mal. 2: 51. 1973; Radcliffe-Smith, Kew Bull. 28: 526–528. fig. 1E. 1974; Airy Shaw, Kew Bull. Add. Ser. 8: 18. 1980; Kew Bull. 36: 247. 1981; Kew Bull. 37: 4. 1982; Philcox, Rev. Handb. Fl. Ceylon 11: 133. 1997; Ngerns. & Chayam. in Chayam. & Welzen, Fl. Thailand 8, 1: 29. 2005; Sagun, G.A.Levin & Welzen, Blumea 55: 46, Fig. 2i, 4d; Map 13. 2010. — Acalypha boehmerioides Miq., Fl. Ind. Bat. Suppl. 1: 459. 1860.— Acalypha fallax Müll.Arg., Linnaea 34: 43. 1865.— Acalypha wightiana Müll.Arg., Linnaea 34: 43. 1865. Annual herbs, 15–100 cm high, stem erect, terete, branched, longitudinal grooved, pubescent. Stipules linear, 1.5–3.5 mm, pubescent. Leaves: petioles terete, 2–6(–8) cm long, longitudinally grooved above, pubescent; blade ovate or ovate-lanceolate, 3–7(–8.5) by 2–4(–5) cm, chartaceous, base obtuse or cuneate, sometimes with 2 caducous appendages, margin crenulate-serrate, apex acuminate, pubescent on both surfaces; nerves 4–6 pairs. Inflorescences solitary, bisexual, axillary, 2–6 cm long, single (or paired), short staminate flowers group apically, pistillate flowers at base. Staminate flowers 4–7 per node; bracts ovate-oblong or ovate-lanceolate, 0.6–1 by c. 0.2 mm, pubescent outside; buds subglobular, 0.3–0.7 mm in diameter; pedicel 0.1–0.2 mm long; sepals 4, ovate, c. 0.5 by 0.3 mm, glandular outside. Pistillate flowers single per node; bracts cup-shaped, reniform when expanded, 2–4 by 4–6 mm, margin minutely serrate with 10–14 teeth, hispid and with glandular hairs; sepals 3, ovate, 0.8–1 by 0.3–0.5 mm, hispid and with glandular hairs; ovary subglobular, 1–1.5 mm in diameter, hispid, stigmas 0.8–2 mm long. Fruits 3-lobed, subglobular, 1.8–2.2 by 2–2.8 mm, hispid and with glandular hairs. Seeds ovoid, 1.2–1.8 by c. 1 mm. Sometimes 1–3 irregular pistillate flowers between staminate and normal pistillate flowers: pedicel 0.5–2 mm long; sepals 3, ovate-lanceolate, pubescent, style 1, attached at base of ovary, apex fimbriate, ovary 1-locular; fruits indehiscent, oblate, 2–3 by c. 2 mm, pubescent, with longitudinal suture in the center, appendages cup-shaped at apex, 1.5–2 mm wide, fimbriate at apex. T h a i l a n d.— NORTHERN: Chiang Mai, Lampang, Nakhon Sawan; NORTH-EASTERN: Khon Kaen; EASTERN: Buri Ram, Si Sa Ket, Ubon Ratchathani; SOUTH-WESTERN: Kanchanaburi, Prachuap Khiri Khan; CENTRAL: Phra Nakhon Si Ayutthaya, Saraburi, Nakhon Pathom, Pathum Thani, Nonthaburi, Bangkok; SOUTH-EASTERN: Chanthaburi; PENINSULAR: Krabi, Trang. D i s t r i b u t i o n.— India (type), Sri Lanka, China, Indochina, Malaysia, Philippines, Sumatra, Java, Borneo, Molucca, Celebes, New Guinea, Bismarck Archipelago, Solomon Islands, Fiji and Polynesia. E c o l o g y.— Weeds in cultivations, along roadsides; alt. 0–500 m.
V e r n a c u l a r.— Tamyae sifan laem (ตำแยซี่ฟันแหลม) (General). 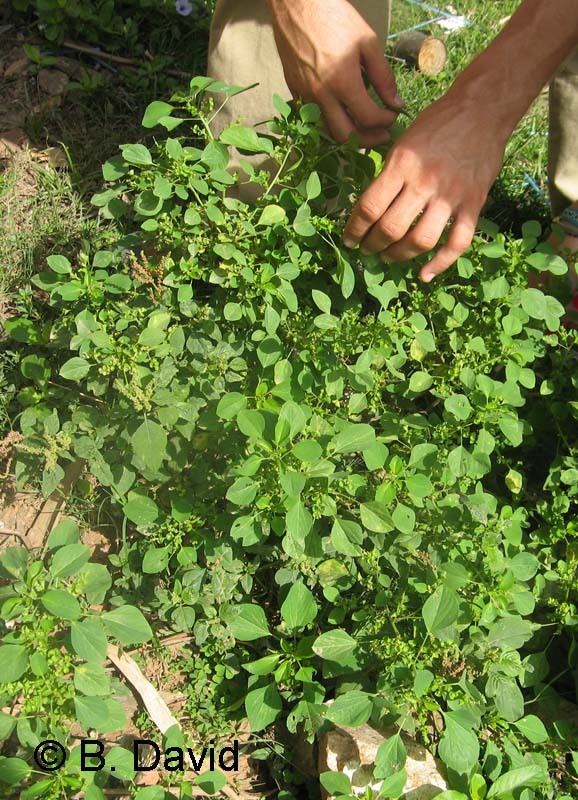 U s e s.— It is used as medication for headache in Indochina. Medicinal plant (citation in Perry!). 7. Acalypha mairei (Lévl.) Schneid. in Sarg., Pl. Wilson. 3: 301. 1916; Pax & K.Hoffm. in Engl. Pflanzenr. IV.147.xvi: 137. 1924; Airy Shaw, Kew Bull. 26: 207. 1972; Rehder, J. Arnold Arbor. 14: 234. 1933; Ngerns. & Chayam. in Chayam. & Welzen, Fl. Thailand 8, 1: 29. 2005.— Morus mairei Lévl. in Fedde, Repert. Spec. Nov. 13: 265. 1914. Shrubs, 1–3 m high, branches terete, lenticellate, pubescent when young. Stipules narrowly triangular or linear, 2–5 mm long, pubescent. Leaves: petioles terete, (1–)2–4(–5.5) cm long, longitudinally grooved above, hispid; blade ovate or ovate-lanceolate, (2–)4–9(–12) by (1–)2–4(–7) cm, chartaceous, base obtuse, cuneate or retuse, margin serrate or crenulate-serrate, apex acute, acuminate or cuspidate, hispid on both surfaces, glabrescent; nerves 4 or 5 pairs. Inflorescences 1 or 2 together, axillary (sometimes terminal), bisexual, or only with staminate or pistillate flowers, 1–4(–6) cm long, staminate part apical, a short pistillate part at base. Staminate flowers 4–7 together per node; bracts ovate, 1–1.5 by 0.8–1 mm, pubescent outside; buds subglobular, 0.5–1 mm in diameter; pedicel 0.3–1 mm long; sepals ovate, c. 0.5 by 0.3 mm, glandular outside. Pistillate flowers single per node; bracts broadly ovate or reniform, oblique, 2–4 by 2–5 mm, margin serrate with 3–7 teeth, sometimes more or less entire, pubescent, longitudinally veined, with translucent dots; sepals 3, ovate, 0.7–1 by 0.3–0.5 mm, pubescent outside; ovary subglobular, 0.8–1.2 mm in diameter, echinate, stigmas 1.5–3 mm long. Fruits 3-lobed, oblate, 2–2.5 by 3–4 mm, echinate, and hirsute. Seeds ovoid, 1.5 by ca. 1 mm. T h a i l a n d.— NORTHERN: Mae Hong Son, Chiang Mai, Chiang Rai, Tak; NORTH-EASTERN: Loei; SOUTH-WESTERN: Uthai Thani, Kanchanaburi; SOUTH-EASTERN: Chon Buri. D i s t r i b u t i o n.— Yunnan (type). E c o l o g y.— In open areas, along streams and waterfalls, on limestone hills, in mixed deciduous and dry evergreen forests; alt. 200–1000 m.
V e r n a c u l a r.— Khang poi khon nam (ขางปอยขนน้ำ), khang poi phon nam (ขางปอยผลหนาม). 8. Acalypha pleiogyne Airy Shaw, Kew Bull. 32: 69. 1977; Ngerns. & Chayam. in Chayam. & Welzen, Fl. Thailand 8, 1: 30, fig. 2, plate I: 3. 2005.— Acalypha sp. nov. Airy Shaw, Kew Bull. 26: 208. 1972. Shrubs, 1–3 m high, stem erect, branched, lenticellate, pubescent when young. Stipules narrowly triangular, 0.8–1.2 mm long, pubescent and with glandular hairs. Leaves: bud prominent, triangular; petioles terete, 1–10 cm long, longitudinally above, pubescent; blade ovate or broadly ovate, 6–17 by 3.5–10 cm, chartaceous, base cordate, cuneate or obtuse, sometimes with 2 glands, margin crenulate-serrate, apex acute, acuminate or cuspidate, puberulous above, tomentose beneath; nerves 4 or 5 pairs. Inflorescences solitary, axillary, bisexual, or only staminate or pistillate flowers, (5–)7–15(–23) cm long, staminate part apical, pistillate flowers at base. Staminate flowes 7–12 per node; bracts ovate, 0.8–1 by 0.4–0.5 mm, hispid and glandular outside; buds 0.3–0.8 mm in diameter; pedicel 0.1–0.3 mm long; sepals ovate, c. 0.5 by 0.3 mm, glandular outside. Pistillate flowers single per node; bracts cup-shaped, reniform when expanded, 4–8 by 6–13 mm, margin serrate with 7–12 teeth, hispid, with glandular hairs, longitudinally veined, with translucent dots; sepals 3, ovate, 0.8–1.2 by 0.4–0.6 mm, hispid and with glandular hairs outside; ovary subglobular, 1–2 mm in diameter, hispid, stigmas 3–6 mm long. Fruits 3-lobed, oblate, 2–3 by 3–4 mm, hispid. Seeds ovoid, 2–2.2 by 1.8–2 mm. T h a i l a n d.— SOUTH-WESTERN: Kanchanaburi (Erawan Waterfalls, type: LARSEN & LARSEN 33969, AAU n.v.), Prachuap Khiri Khan. D i s t r i b u t i o n.— Endemic. E c o l o g y.— Along streams, on limestone hills, in dry evergreen forests; alt. 20–300 m.
V e r n a c u l a r.— Khang poi erawan (ขางปอยเอราวัณ) (South-western). 9. Acalypha siamensis Oliv. ex Gage, Rec. Bot. Surv. Ind. 9: 238. 1922; Ridl., Fl. Mal. Pen. 3: 274. 1924; Merr., J. Arnold Arbor. 19: 39. 1938; Airy Shaw, Kew Bull. 26: 207. 1972; Whitmore, Tree Fl. Mal. 2: 51. 1973; Burkill, Dict. Econ. Prod. Mal. Pen. : 25. 1966; L.M.Perry, Med. Pl. East and Southeast Asia: 136. 1980; Keng, Concise Fl. Sing. : 105. 1990; Ngerns. & Chayam. in Chayam. & Welzen, Fl. Thailand 8, 1: 32, fig. 3. 2005; Sagun, G.A.Levin & Welzen, Blumea 55: 51, Fig. 2l, 5d, 6j1-j2; Map 17. 2010.— Acalypha evrardii Gagnep., Bull. Soc. Bot. France 70: 871. 1923.— Acalypha sphenophylla Pax & K.Hoffm. in Engl., Pflanzenr. IV.147.xvi: 110. 1924. Shrubs, 0.5–3 m high, branches terete, longitudinally fissured, pubescent when young. Stipules narrowly triangular, 2–2.5 mm long, pubescent and with glandular hairs. Leaves: petioles short, 0.1–0.8 cm long, longitudinally grooved above, pubescent; blade rhomboid, 2–7(–11) by 1–3.5(–5) cm, coriaceous, base cuneate, margin crenulate-serrate, apex acute or obtuse, glabrous on both surfaces; nerves 4 or 5 pairs. Inflorescences 1(or 2) together, bisexual or only staminate or pistillate flowers, axillary, (1.5–)3–6 cm long, with staminate part apically and pistillate flowers at base. Staminate flowers 5–7 per node; bracts triangular, 1–1.2 by 1.2–1.5 mm, pubescent and glandular outside; buds 0.5–1 mm in diameter; pedicel 0.1–0.5 mm; sepals ovate, c. 0.5 by 0.3 mm, glandular outside. Pistillate flowers single per node; bracts cup-shaped, reniform when expanded, 5–7 by 6–10 mm, margin serrate with 9–15 teeth, glossy on both surfaces, with prominent reticulated venation outside, with translucent dots; sepals 3, ovate, c. 2 by 1 mm, pubescent outside; ovary subglobular, 1–2 mm in diameter, echinate stigmas 2–5 mm long. Fruits (2- or)3-lobed, oblate, 3–5 by 4–7 mm, armed with unsharp thorns with an apical, caducous gland. Seeds ovoid or subglobular, 2–3 by 2–2.5 mm. T h a i l a n d.— NORTHERN: Chiang Mai; EASTERN: Nakhon Ratchasima (Khao Yai National Park); SOUTH-WESTERN: Kanchanaburi, Ratchaburi, Phetchaburi (Kaeng Krachan), Prachuap Khiri Khan (Sam Roi Yot, Bang Saphan, syntype: KEITH); CENTRAL: Nakhon Pathom, Bangkok; SOUTH-EASTERN: Trat; PENINSULAR: Chumphon, Nakhon Si Thammarat (Khao Luang), Phatthalung (Khao Hua Taek), Trang, Satun, Pattani, Narathiwat. D i s t r i b u t i o n.— Burma (syntypes), Indochina, Malaysia (syntypes), Singapore and Sumatra. E c o l o g y.— Dry evergreen forest, on limestone hills; alt. 100–600 m.
V e r n a c u l a r.— Cha khoi (ชาข่อย) (Northern); cha yuan (ชาญวน), ka nam (กาน้ำ) (Bangkok); cha ruesi (ชาฤาษี) (Central); phak duk (ผักดุก), phak dut (ผักดูด) (Prachuap Khiri Khan); cha pa (ชาป่า) (Pattani). U s e s.— It is used as ornamental and medicinal plant. 10. 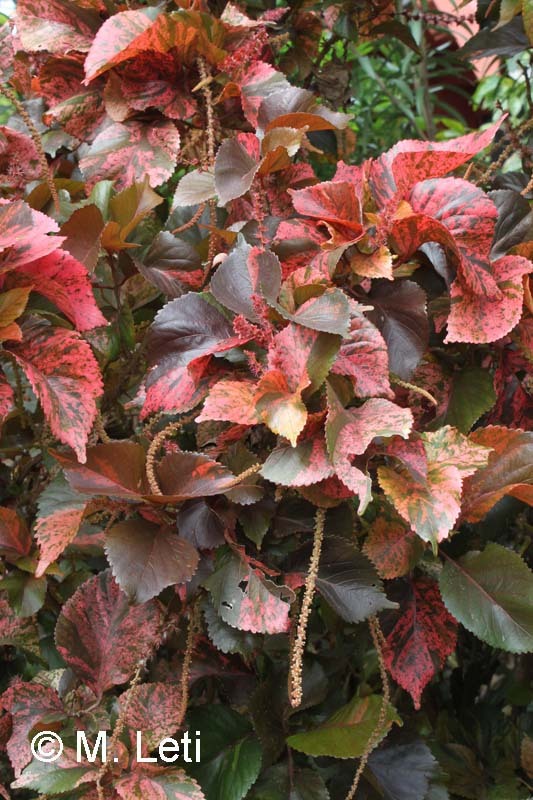 Acalypha wilkesiana Müll.Arg. in DC., Prodr. 15, 2: 817. 1866; Pax & K.Hoffm. in Engl., Pflanzenr. IV.147.xvi: 153. 1924; Backer & Bakh.f., Fl. Java 1: 489. 1963; Airy Shaw, Kew Bull. 26: 208. 1972; Whitmore, Tree Fl. Mal. 2: 51. 1973; Airy Shaw, Kew Bull. 35: 586. 1980; Kew Bull. Add. Ser. 8: 21. 1980; Kew Bull. 37: 4. 1982; Keng, Concise Fl. Sing. : 106. 1990; Ngerns. & Chayam. in Chayam. & Welzen, Fl. Thailand 8, 1: 32. 2005; Sagun, G.A.Levin & Welzen, Blumea 55: 52, Fig. 20, 6m1-m2. 2010. Shrubs, 0.5–4 m high, dioecious (rarely monoecious), branches terete, lenticellate, pubescent when young. Stipules narrowly triangular, 4–7 mm long, pubescent. Leaves: petioles 2–4 cm long, longitudinally grooved above, hispid; blade broadly ovate or ovate, 7–18 by 5–15 cm, coriaceous, base cuneate or obtuse, margin crenulate-serrate, apex acute or acuminate, hispid on both surfaces; nerves 5 or 6 pairs. Inflorescences solitary, mostly unisexual, sometimes both sexes, axillary, upright or pendulous, 5–14(–18) cm long, red, greenish red, or pale green. 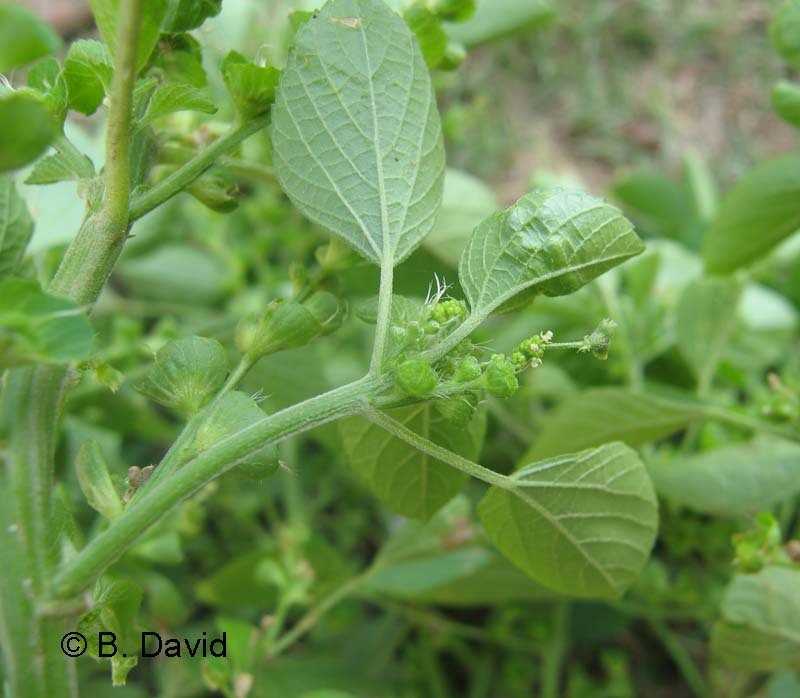 Staminate flowers 5–7 per node; bracts ovate, 0.8–1 by 0.4–0.5 mm, pubescent; buds 0.3–0. 8 mm in diam; pedicel 0.1–0.2 mm long; sepals ovate, c. 0.5 by 0.3 mm, glandular outside. Pistillate flowers single per node; bracts cup-shaped, reniform when expanded, c. 3 by 4–5 mm, margin serrate with 5–11 teeth, hispid outside; sepals 3, ovate, 0.7–1 by 0.3–0.5 mm, pubescent outside; ovary subglobular, 0.8–1.2 mm in diameter, hispid, stigmas 3–5 mm long, reddish, pinkish or bright green. Fruits not seen. D i s t r i b u t i o n.— Fiji (type), widely cultivated elsewhere. E c o l o g y.— Cultivated as ornamental. V e r n a c u l a r.— Hu kratai (หูกระต่าย), pho dang (โพด่าง), pho daeng (โพแดง), pho lai (โพลาย), pho ngoen (โพเงิน), pho thong (โพทอง), saeng thong (แสงทอง) (Central); bai ngoen (ใบเงิน) (Chon Buri); Painted copper leaf, Jacobs’s coast. U s e s.— Ornamental, often with variegated or reddish leaves.